"More of us have disappeared. More vanish with every breath. And they are coming closer." Don't look at Them. Never let Them know you can see Them. That is Ethan Chase's unbreakable rule. Until the fey he avoids at all costs—including his reputation—begin to disappear, and Ethan is attacked. Now he must change the rules to protect his family. To save a girl he never thought he'd dare to fall for. 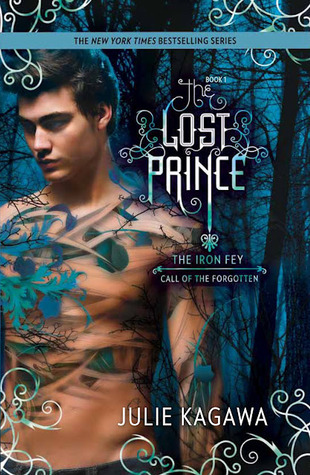 I like this one better than the other Iron Fey books and I thinks it's because I absolutely love Ethan as a protagonist. He's got such a new look towards the Fey and such a different life than Meghan. The girl in this story, Kenzie, is balsy and sure of herself, but she's a good match for Ethan who isn't a lovely, cuddly, little boy with curls anymore. I love the fact that he practices some kind of martial arts, because that has always fascinated me. Maybe if I had the guts and the fighting skills, I would have had the same hobby as Ethan. I've always regretted that I didn't start martial arts when I was younger. When I think about Ethan and Todd, I keep picturing the two guys from "Never Back Down", with Brian, the bully, being the bad guy from the movie. Never Back Down is one of my favourite movies, so that's definetely not a bad reference! I also really like the fact that some characters were able to surprise me during the story. They didn't always react to certain situations they way I thought they would. Overall, these characters were far more appealing to me than the ones in the other Iron Fey books. Somehow I couldn't make a connection with Meghan and Ash, not they way I connected with Ethan and Kenzie. Maybe it's because they are human and Meghan and Ash are Fey? But what about Puck then though? I adore him! One of my other favourites in The Lost Prince is Razor. He takes the cuteness factor of these books to a whole new level. Can I get me a Razor somewhere? I want one. My conclusion for this book: I really liked it. It gave a whole new perspective towards the Fey and I think I needed that after four books of Meghan and Ash. It was also a very good decision to make a spin-off about Ethan! Baby brother all grown up? Seventeen years later? Sounds promising enough to me! Thanks to the publisher and the author for giving me the opportunity to read this book. This book was provided to me through NetGalley.